on Lake Pontchartrain aboard their current sailboat, Moon Shadow, a 30' Catalina tall rig. 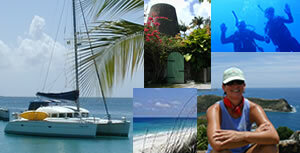 Welcome to the Indigo Moon website that chronicles the sailing adventures of Buddy and Melissa Stockwell! 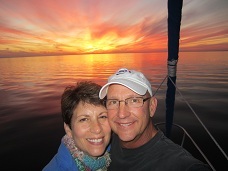 Our sailing story and this website are all about how a South Louisiana couple managed to break free of the working world and leave our careers for a significant number of years. We embarked on a genuine sailing adventure that took us over new horizons and to new destinations far away from our home. For almost six years (2005 to 2010), we lived full- time aboard Indigo Moon, a Lagoon 380 catamaran and sailed a total of 19,000 nautical miles. No, we are not financially independent, and likely never will be. But we are rich beyond our wildest dreams when it comes to diverse life experiences, travel, and honest-to-goodness adventure. The truth is that anyone reading this can embark on a full-time sailing adventure: all you have to do is be willing to let go of a lot of things, both material and emotional, and go for it! Buddy, a Baton Rouge lawyer with a solo practice, sold all the office furniture and systems and liquidated the practice. Melissa left her career in Information Technology. Midstream in successful careers, and not knowing where we would eventually end up, we “pulled the ripcord” and dove head-first into an adventure of a lifetime. We sold our house and cars. A huge yard sale turned much of our belongings into cash (of course at pennies on the dollar of what we paid). We deposited some household furniture and irreplaceable items into a climate controlled storage unit and made sure we were free to sail wherever our adventure took us without worries over jobs or protecting assets back home. Our trip logs begin with our acquisition of our once beloved catamaran, Indigo Moon, and then report a fair account of our adventures. If you come along with us on this journey, you will quickly see that life aboard a sailboat is hard work. As such, it’s smart to undertake a sailing adventure well before retirement age, while you are in best health and physical condition. 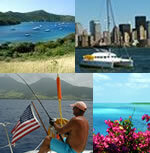 If you read our trip logs, you’ll also come to know that a live aboard sailing adventure has many highs and lows. And so, come along with us and experience everything from sheer wonder and unmatched ecstasy to fear and terror at unprecedented levels. In the end, we returned to south Louisiana and reentered the working world. But we are not the same people we were when we left. Whether or not you are interested in undertaking such an adventure and look at the website for research, or just want to come along on a vicarious adventure, we welcome you to the Indigo Moon Website! No passport or suitcase needed! All you have to do is click on the Captain's Log and enjoy the ride!